Damp Proofing and Wood Rot, Kingston. 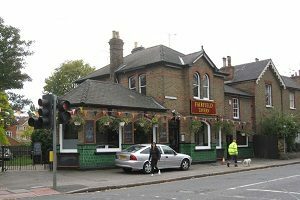 We were contacted by the owners of the Fairfield Tavern in Kingston-upon Thames that the pub landlord had reported considerably damp walls and rotting floors in the bar area of the building. A Tapco HomeDry surveyor attended the property to carry out a thorough damp and timber survey, including taking moisture readings to the walls, using a calibrated damp meter and lifting floorboards to inspect the sub floor timbers. High levels of moisture were recorded to the surface of the walls, which according to the pattern, were typical of rising damp. The floors were found to be affected by an advanced attack of Wet Rot Fungus (Cvniophora puteana) and infestations of woodworm, Common Furniture Beetle (Anobium punctatum) The results of this were plaster and timber flooring would have to be removed and replaced. On recipe of our detailed report and recommendations our client instructed us to carry out the work. Doing this, in a bust pub was never going to be easy so it was decided that we do it during the night, in stages. The specified, damp wall plaster was removed and areas of the rooted flooring were cut out and all rubble was immediately removed to a designated place for disposal. The void under the floors was cleared of rubble and the flooring timbers were replaced using new pre-treated timber, protected from damp masonry by a damp proof course. a chosen line of mortar joint at the base of the damp walls was pattern drilled, the holes cleared of dust and injected with a Silane/Siloxane cream damp proof course at the approved rates. The walls were then prepared and replastered in accordance wit our specification. New skirting boards were fitted to match existing. All of the damp proofing, wood rot and woodworm treatment is covered by our 20 Year Guarantee, which is protected by the Guarantee Protection Insurance (GPI). Whether it’s a commercial or domestic property, we are the experts and will consider your needs at all times. Call the best first, call Tapco HomeDry.